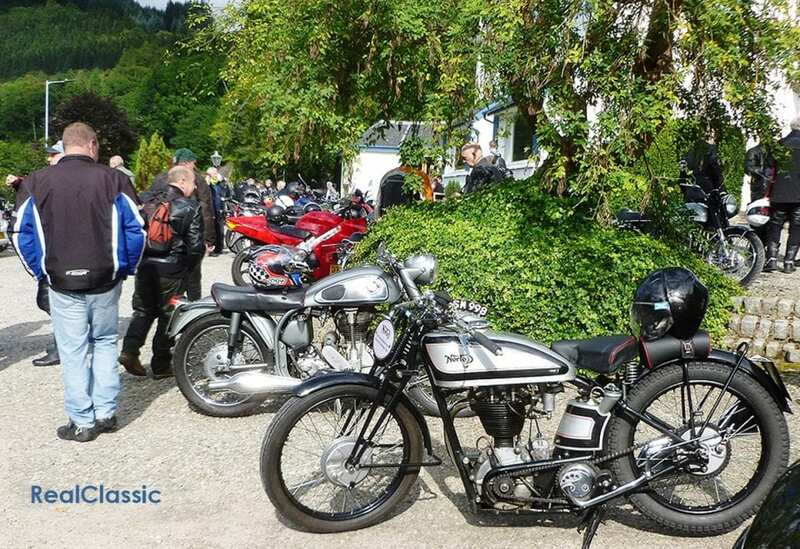 The average vintage vehicle travels 1100 miles a year, and there are nearly 300,000 classic bikes on the DVLA’s database. 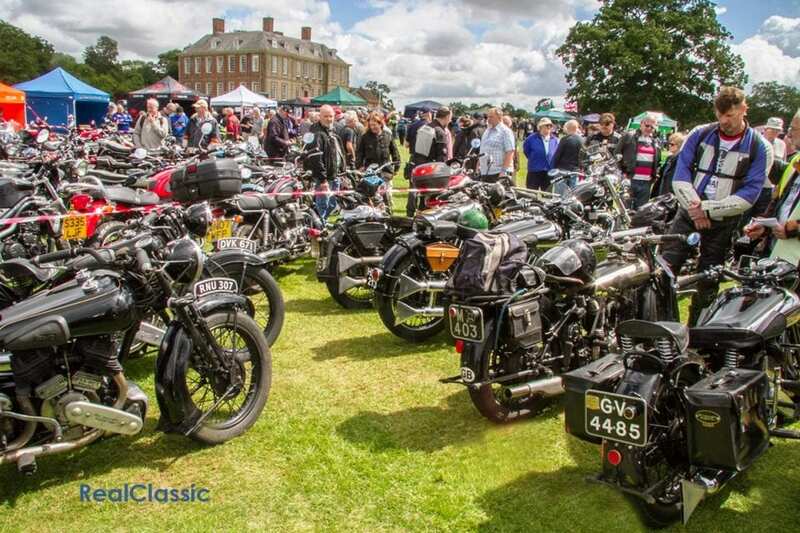 Which classic motorcycle marque do you think is the most popular? Triumph? BSA, maybe? 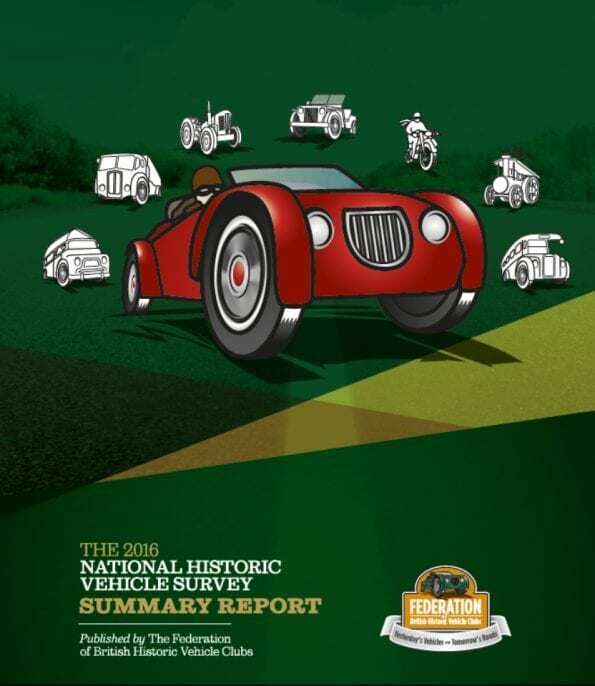 Every five years in recent times, the Federation of British Historic Vehicle Clubs carries out a survey of the historic vehicle scene in the United Kingdom, and the 2016 survey results have just been published. This is believed to be the most comprehensive survey into vintage and classic vehicles carried out anywhere in the world – which isn’t entirely surprising, given how well-established the ‘classic scene’ is in the UK. This time around, 13,929 responses were received from organisations and individuals during the six month consultation period. The Fed’s research was completed and evaluated this summer, and the results were presented to the Houses of Parliament in October. The FBHVC found that 8.2 million people in the UK have an interest in historic vehicles, and further research indicates that 23 million people view historic vehicles as an important part of Britain’s heritage. Some 16 million people also believe that it is important to use historic vehicles rather than simply display them in museums. (We assume these figures are extrapolations from a sample population. We don’t think the man from the Fed knocked on 23 million front doors to ask people what they think of the importance of old clunkers). The DVLA’s database gives some more solid numbers. There ar­e 1,039,950 registered historic vehicles, of which some 58% are registered for road use. The combined value of all these classic cars, vintage motorcycles and old bikes is estimated to be £17.8 billion (yes, billion with a B), and they are owned by more than half a million enthusiasts. Each historic vehicle travels an average of 1100 miles a year. Interestingly, the ‘average travelled’ statistic was 516 miles in 1997, then 350 miles in 2006 and 288 miles in 2011. More on that later. 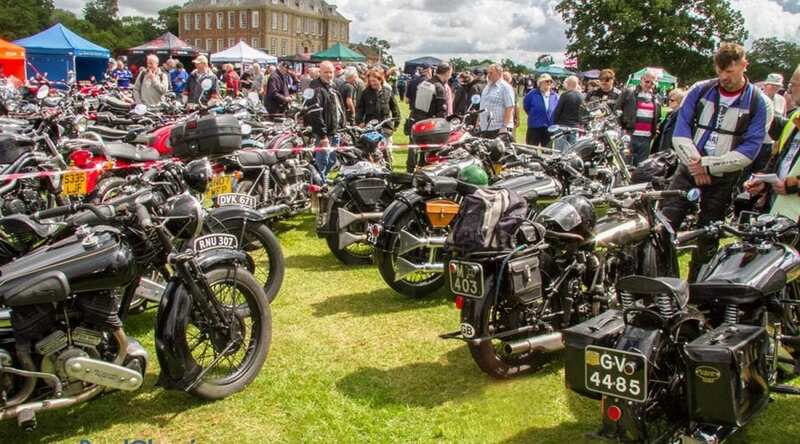 Nearly 30% of the total number of historic vehicles, some 296,936, are classic bikes. Again, this figure comes from the DVLA and represents those bikes registered before 1985. Of these, the most popular marque was Honda, accounting for some 5% of the total; nearly 15,000 machines. Given how many motorcycles Honda sold between, say, 1969 and the cut-off date of 1985, it’s hardly surprisingly that the marque is so well represented among older motorcycles. There are, after all, stacks of Superdreams still kicking around. Triumph and BSA were the next best-represented marques (3% apiece, nearly 9000 motorcycles), with Yamaha and Suzuki on 2% (6000 bikes). 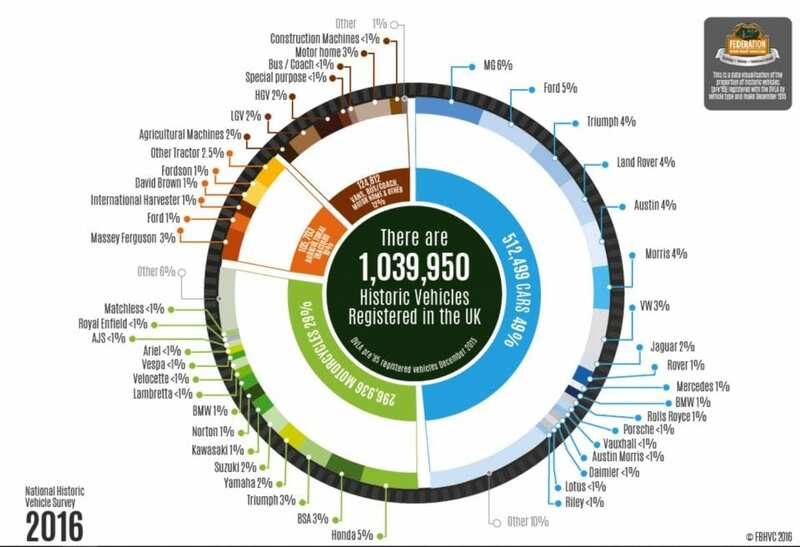 Only 1% of the historic bikes registered with the DVLA are Nortons or BMWs. The Fed estimate that owners of both two- and four-wheeled classics spend £3400 apiece directly on their vehicles. All the ‘related activities’ (which presumably includes insurance, clothing, events and even magazines) pour a massive £5.5 billion into the UK economy. Some £662 million is spent in Britain by oversea enthusiasts; roughly equivalent in value to the UK’s annual exports of clocks, watches and related parts. (That’s the most obscure illustrative fact we could find. Hope you like it). Back to the Fed’s findings. 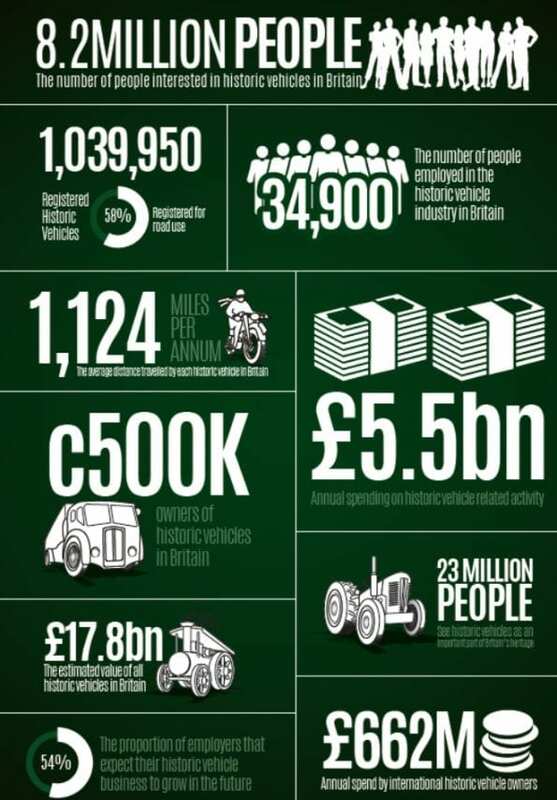 Almost 35,000 people are employed in the vintage motor industry; a 25% increase since the last survey in 2011. The vintage vehicle industry provides some 7600 part-time jobs as well as 3800 apprenticeships or trainee programmes. Attendance at club events is also on the rise. Classic clubs estimated that in 2011 some 4.5 million people attended their events. In 2016, this figure had grown by 20% to 5.5 million. Of course, s ome of the trends in the data may reflect changes in how the numbers are gathered. A decade ago, most responses probably came in by post. These days, internet surveys are the easiest way to contact vintage enthusiasts. This might also explain why the average distance travelled appears to have quadrupled in the last five years (up from 288 miles to 1100 miles). It certainly has become easier to keep an old bike in use on the road, with rapid access to improved spares supplies and trade specialists – and perhaps removing the MoT requirement on older machines has encouraged some of them out of the shed and onto the streets again. It’s likely that this big jump in mileage also reflects more accurate reporting from the people taking part in the survey. The upshot of all these numbers is, according to David Whale, chairman of the FBHVC, ‘that the historic vehicle movement is alive and flourishing.’ The Fed also acknowledges the challenges facing the classic movement; a loss of technical skills and the growing age of participants are both mentioned. Also, ‘whilst we have enjoyed a period of low inflation the values of historic vehicles have risen steadily. The benefit to enthusiasts is that their passion has also become an investment. The FBHVC exists to uphold the freedom to use historic vehicles on the road. 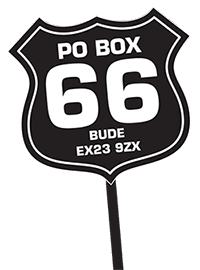 It represents the interests of vintage vehicle enthusiasts to politicians, government officials and legislators both in the United Kingdom and through the FIVA in Europe. There are more than 500 subscriber organisations representing a total membership of over 250,000 in addition to individual trade supporters.